One small miracle occurred this weekend. My husband and I spent our anniversary in the Loop. Away from our boys. Away from caregiving responsibilities of our parents. We've spent our special day in more exotic locales, like St. Thomas, Hawaii, and Mexico, but it felt good to celebrate close to home this year. Even if it was cold and rainy. We strolled from the Palmer House Hilton down State Street and made it all the way to Water Tower and back, all the while admiring Christmas in Chicago. Twinkling lights shone on just about every tree inside and outside. The blue multi-colored tree at Christkindl Market was huge. The colorful tree outside the Hancock Tower was lovely. The tall tree with white lights outside the Tribune Tower was also bright and festive. 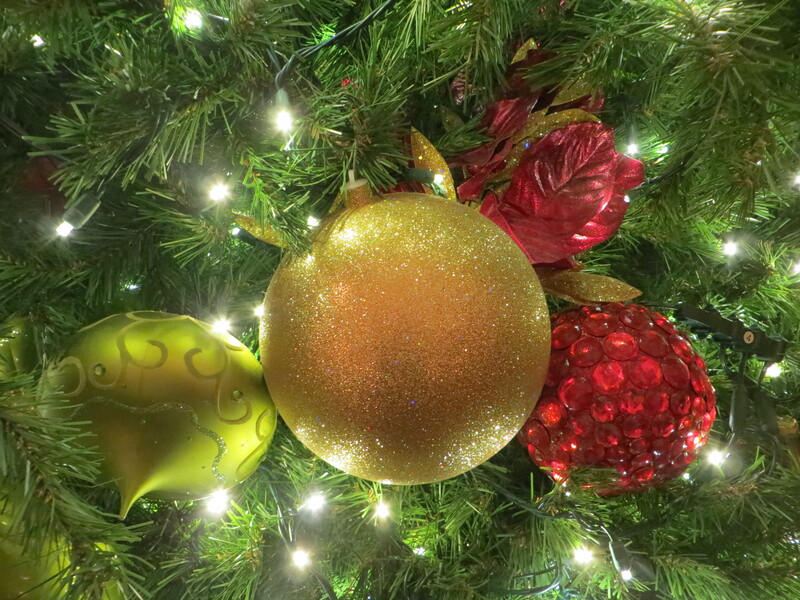 The 15-foot glitzy tree with large gold and red ornaments inside the Palmer House Hilton? Spectacular. 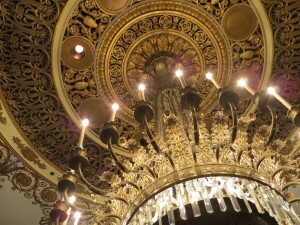 A perfect fit for the iconic lobby with its multitude of gold gilt. And its multitude of happy people. The hustle and bustle of hundreds of Christmas revelers talking and walking inside the expansive lobby of one of the largest and oldest hotels was energizing. We feasted our eyes on all the 1920's glamour and the fabulous ceiling worthy of the Art Institute, yet were curious about the fancy double doors on the second floor. We climbed the elegant carpeted stairway and gingerly pushed open the doors to the Empire Room. They opened up to an empty ballroom with a gorgeously draped stage, although just hours earlier it had been the site for wedding photos. I could understand why. The jumbo gold medallion designs on the ceiling atop the fabulous crystal chandeliers were magnificent, pretty close to jaw-dropping. Truly an amazing room in an amazing hotel. But our anniversary get-away was not the miracle. Neither was the Palmer House Hilton Christmas splendor. Nor the historic furnishings, beautiful as they were. The fact that we LEFT our 3 teen boys alone, overnight, for the first time was the miracle. Somehow this milestone occurred naturally, although months ago we wouldn't have considered it. Somehow we planned a much-needed night out for ourselves and decided that our teen boys were probably old enough and mature enough to behave themselves. We let go of them, and everything was OK. Most likely there will be more letting go in the near future. I also let go of my demanding caregiving routine and was able to relax and enjoy a different pace. I chose to not feel guilty that I wasn't helping my parents. I gave myself permission to have fun. And most importantly, to spend quality time with my husband, who is my best friend. We came home refreshed and eager to share about our weekend. The boys did great, took care of Lucy, our dog, finished everything on the chore list, attended church and youth group, and even studied for their classes. Yes, they did stay up very late to watch A Few Good Men. And that was fine. My parents were also fine. They were safe, happy, and content and had the right level of care, even without me. I told my dad about our peek into the Empire Room and he smiled. He remembered the hustle and bustle of the Palmer House and his numerous visits there. He was glad that we had a good time downtown. My mom was glad to hear me talk excitedly about Chicago. Restarting The Senior Shuffle this week after my fun-filled Chicago visit has been a bit hard. But it was so worth it! I'm glad I was able to let go physically as well as emotionally. Funny how it took letting go to really get away.